The Consumer Electronics Show, or CES is a haven for some of the most groundbreaking technology in the world. A big part of the show is seeing the newest innovations in automobiles. For example, there’s Genovation. They are an engineering skunkworks based in Rockville, Maryland. 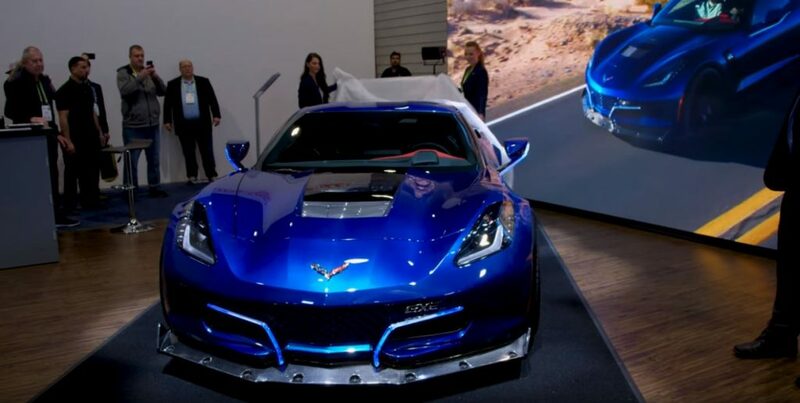 And this year at CES they’ve confirmed and unveiled their Corvette-based electric sports car. It was back in February of last year 2017, that Genovation went and made their Corvette-based prototype, the GXE) and tested it. The car not only worked it managed to hit a top speed of 209 mph during testing. For a little perspective, prior to this the standing mile record speed for electric cars was 190.4 mph. The prototype isn’t exactly the same car that they’re debuting at CES. The major difference is that the prototype was based on the C6 Corvette Z06. Meanwhile the production GXE uses the C7 Corvette Grand Sport as the platform. You can tell the difference between Genovation’s car versus the original Corvette from which it was built from through the unique visual modifications. Genovation’s car raises the bumper while also rounding out the taillights. According to Genovation, they went with the Corvette because it has a particularly lightweight frame. Genovation also wanted to gif a tip of the hat to classic American automotive engineering. The GXE is more than just an All-Electric Corvette. Genovation went and developed it with a few upgrades such as a seven-speed manual transmission. It may seem strange for an electric car to even need a manual transmission, given how Tesla’s single-speed reduction gearbox is largely the model most electric carmakers tend to follow. The thing is that a single-speed manual gearbox gives drivers excellent acceleration but doesn’t really allow for reaching impressive top speeds. Using a manual gearbox system, even on an electric car gives drivers a combination of quick acceleration in addition to high speeds. How fast? According to Genovation, the GXE will be able to hit a sub-3-second 0-60 mph time in addition to a top speed of 220 miles per hour (which is higher than the prototype test). Opening up a GXE you can immediately find a system of dual or twin electric motors. Those help for it to produce 800 horsepower. And this car also manages 700 pound-feet of torque. Powering up the GXE are five battery packs are good for 61.6kWh of storage of power. That’s about enough for an estimated range of 175 miles. Keep in mind that if you hit the pedal to the metal and hit high speeds, the range diminishes significantly. While the base Corvette can come equipped with GM’s signature magnetic ride control, Genovation instead opted to use a 3rd party suspension system. This system can be programmed on the fly for all manner of terrains. Another notable feature is that fact that the GXE interior is all alcantara. Every single visible panel is wrapped or quilted with the material. Both interiors and exteriors can be customized for every customer. And speaking of customers, it seems only the most resourceful car enthusiasts will be able to get one. Genovation is only producing 75 of the GXE cars at a starting price of $750,000. As we move towards electric cars, long gone are the days where electric vehicles are considered conservative and not very much fun. Hopefully more electric automakers will take notice of projects like GXE and deliver some interesting rides in the future!